For the 1994 short story collection by Irvine Welsh, see The Acid House. Acid house (also simply known as just "acid") is a subgenre of house music developed around the mid-1980s by DJs from Chicago. The style was defined primarily by the deep basslines and "squelching" sounds of the Roland TB-303 electronic synthesizer-sequencer. Acid house spread to the United Kingdom and continental Europe, where it was played by DJs in the acid house and later rave scenes. By the late 1980s, acid house had moved into the British mainstream, where it had some influence on pop and dance styles. Acid house's minimalist production aesthetic combined house music's ubiquitous programmed four-on-the-floor 4/4 beat with the electronic squelch sound produced by the Roland TB-303 electronic synthesizer-sequencer by constantly modulating its frequency and resonance controls to create movement in otherwise simple bass patterns. Other elements, such as synthetic strings and stabs, were usually minimal. Sometimes tracks were instrumentals such as Phuture's "Acid Tracks", or contained full vocal performances such as Pierre's Pfantasy Club's "Dream Girl", while others were essentially instrumentals complemented by the odd spoken word 'drop-in', such as Phuture's "Slam". Two simple patterns on a synthesizer similar to the Roland TB-303 bass synthesizer. This is not the sound of an actual TB-303. The second pattern has had the filter EG attack time altered. Note that the TB-303 does not have an adjustment for envelope attack time, and envelopes aside, the real 303 creates an otherwise notably different sound to this one. Two simple overdriven patterns on the same synthesizer as in the previous clip. The second pattern has varying resonance to give a harsh screeching sound. Both patterns have gradual changes in cutoff frequency. One account ties it to Phuture's "Acid Tracks". Before the song was given a title for commercial release, it was played by DJ Ron Hardy at a nightclub where psychedelic drugs were reportedly used. The club's patrons called the song "Ron Hardy's Acid Track" (or "Ron Hardy's Acid Trax"). The song was released with the title "Acid Tracks" on Larry Sherman's label Trax Records in 1987. Sources differ on whether it was Phuture or Sherman who chose the title; Phuture's DJ Pierre says the group did because the song was already known by that title, but Sherman says he chose the title because the song reminded him of acid rock. Regardless, after the release of Phuture's song, the term acid house came into common parlance. Some accounts disavow psychedelic connotations. One theory, holding that acid was a derogatory reference towards the use of samples in acid house music, was repeated in the press and in the British House of Commons. In this theory, the term acid came from the slang term "acid burning", which the Oxford Dictionary of New Words calls "a term for stealing." In 1991, UK Libertarian advocate Paul Staines claimed that he had coined this theory to discourage the government from adopting anti-rave party legislation. The earliest recorded examples of acid house are a matter of debate. At least one historian considers the Phuture's "Acid Trax" to be the genre's earliest example; DJ Pierre says it may have been composed as early as 1985, but it was not released until 1987. Another points out Sleezy D's "I've Lost Control" (1986) was the first to be released on vinyl, but it is impossible to know which track was created first. The first acid house records were produced in Chicago, and Illinois. 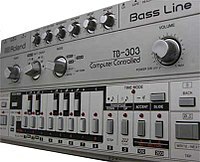 Phuture, a group founded by Nathan "DJ Pierre" Jones, Earl "Spanky" Smith Jr., and Herbert "Herb J" Jackson, is credited with having been the first to use the TB-303 in the house-music context (the instrument appeared as early as 1983 in disco via Alexander Robotnick). The group's 12-minute "Acid Tracks" was recorded to tape and was played by DJ Ron Hardy at the Music Box, where Hardy was resident DJ. Hardy once played it four times over the course of an evening until the crowd responded favorably. Chicago's house music scene suffered a crackdown on parties and events by the police. Sales of house records dwindled and, by 1988, the genre was selling less than a tenth as many records as at the height of the style's popularity. However, house and especially acid house was beginning to experience a surge in popularity in Britain. Another club called Trip was opened in June 1988 by Nicky Holloway at the Astoria in London's West End. Trip was geared directly towards the acid house music scene. It was known for its intensity and stayed open until 3 AM. The patrons would spill into the streets chanting and drew the police on regular occasions. The reputation that occurrences like this created along with the UK's strong anti-club laws started to make it increasingly difficult to offer events in the conventional club atmosphere. Considered illegal in London during the late 80s, after-hour clubbing was against the law. However, this did not stop the club-goers from continuing after-hours dancing. Police would raid the after-hour parties, so the groups began to assemble inside warehouses and other inconspicuous venues in secret, hence also marking the first developments of the rave. Raves were well attended at this time and consisted of single events or moving series of parties thrown by production companies or unlicensed clubs. Two well-known groups at this point were Sunrise, who held particularly massive outdoor events, and Revolution in Progress (RIP), known for the dark atmosphere and hard music at events which were usually thrown in warehouses or at Clink Street, a South East London nightclub housed in a former jail. With promoters like ( The Big Lad ) Shane Mckenzie and the Gang back in 1987 doing small party's in NW london and moving the Rave from the streets and the fields to the clubs of London 1990- 2005 seeing the future of raves in clubs all over the UK and Spain. Despite this, one tune broke through into the mainstream in November 1988. Stakker Humanoid, produced by Brian Dougans (later of Future Sound of London), was a hit not just at influential clubs like The Haçienda in Manchester or Shoom in London, but was championed by mainstream stalwarts like Radio DJ Bruno Brookes and Kylie and Jason producer Pete Waterman. It went on to reach number 17 in the UK charts in November 1988, leading to Dougans' appearance on Top of the Pops on 1 December 1988. Samantha Fox – For "Love House" and "I Wanna Have Some Fun"
^ "Acid House Entry". AllMusic. ^ "Trance". Allmusic. Retrieved 9 July 2012. ^ Shapiro, Peter (2000). Modulations: A History of Electronic Music. Caipirinha Productions Inc. pp. 76–77. ISBN 0-8195-6498-2. ^ Dave Walsh (2003). "The Alan Moore interview". Blather. Archived from the original on 21 June 2007. Retrieved 2007-07-09. There were big coincidences happening around the work [sic] and then all of a sudden the central image of it has been nicked on all these acid house t-shirts everywhere. ^ Savage, Jon (2009-02-21). "The history of the smiley face symbol". the Guardian. Retrieved 2016-06-28. ^ a b c d e Cheeseman, Phil. "The History Of House". ^ a b The Oxford Dictionary of New Words (Knowles, Elizabeth [ed], Elliott, Elizabeth [ed]). Second Edition, Oxford University Press, 1997. ISBN 0-19-863152-9. ^ Rietveld, H. C., This is Our House: House Music, Cultural Spaces and Technologies, Ashgate Publishing, Aldershot, 1998 (ISBN 978-1857422429). ^ Rietveld, H.C., This is Our House: House Music, Cultural Spaces and Technologies, Ashgate Publishing, Aldershot, 1998 (ISBN 978-1857422429), p. 143. ^ Quoted in the British House of Commons Hansard, 9 March 1990, column 1111. ^ Rushkoff, Douglas (1994, 2nd ed. 2002). Cyberia: Life in the Trenches of Cyberspace. ISBN 1-903083-24-9. ^ Staines, Paul (1991). "Acid House Parties Against the Lifestyle Police and the Safety Nazis" article in Political Notes (ISSN 0267-7059), issue 55 (ISBN 1-85637-039-9). Also quoted in Saunders, Nicholas with Doblin, Rick (July 1, 1996). Ecstasy: Dance, Trance & Transformation, Quick American Publishing Company. ISBN 0-932551-20-3. ^ Garratt, Sheryl (May 6, 1999). Adventures in Wonderland: Decade of Club Culture. Headline Book Publishing Ltd. (UK). ISBN 0-7472-5846-5. ^ a b Holthouse, David (1995-12-21). "Rave Review". Phoenix New Times. ^ Reynolds, Simon (2000-05-23). "Living for Oblivion". The Village Voice. ^ Giannelli, Fred (June 2000). ""There are a lot of fools in the world" (interview of Fred Gianelli for the Family Ov Psychick Individuals (FOPI) Psychic TV fan club)". Archived from the original on July 2007. ^ a b Cheeseman 1992. "I've Lost Control" was made by Adonis and Marshall Jefferson and was certainly the first acid track to make it to vinyl, though which was created first will possibly never be known for sure. ^ Shapiro, Peter (2000). Modulations: A History of Electronic Music. Caipirinha Productions Inc. p. 32. ISBN 0-8195-6498-2. ^ Shapiro, Peter (2000). Modulations: A History of Electronic Music. Caipirinha Productions Inc. p. 34. ISBN 0-8195-6498-2. ^ Finnegan, Rory. Rave New World – Commercialisation Of Rave. Fantazia. Retrieved 2011-10-23 from http://www.fantazia.org.uk/Scene/ravenewworld.htm. ^ Shapiro, Peter (2000). Modulations: A History of Electronic Music. Caipirinha Productions Inc. p. 60. ISBN 0-8195-6498-2. ^ Shapiro, Peter (2000). Modulations: A History of Electronic Music. Caipirinha Productions Inc. p. 64. ISBN 0-8195-6498-2. ^ Reynolds, Simon. Generation Ecstasy. p. 61. ^ a b Shapiro, Peter (2000). Modulations: A History of Electronic Music. Caipirinha Productions Inc. p. 62. ISBN 0-8195-6498-2. ^ a b Reynolds, Simon. Generation Ecstasy. p. 63. ^ DeRogatis, Jim (December 1, 2003). Turn on Your Mind: Four Decades of Great Psychedelic Rock, 436. Google Print. ISBN 0-634-05548-8 (accessed June 9, 2005). Also available in print from Hal Leonard. ^ Donnally, Trish. (October 17, 1988). Article published in the San Francisco Chronicle and distributed via the Los Angeles Times Syndicate to other newspapers and published under various headlines. ^ Foderaro, Lisa (1988-12-18). "At some Manhattan nightclubs, 'X' marks the 'inner circle's' perfect drug". San Diego Union. p. A–45. This article was distributed by the New York Times News Service and published under various headlines in several U.S. newspapers. ^ Leary, Mike. (November 24, 1988). Philadelphia Inquirer. ^ "Rave's relationship to the Media". Fantazia Rave Archive. Archived from the original on 24 October 2007. Retrieved 2007-10-23. ^ Stuart Aitken (11 November 2013). "Stakker Humanoid: how the Future Sound of London won hearts and minds". guardian.co.uk. ^ a b Pattison, Louis (10 April 2010). "Charanjit Singh, acid house pioneer". The Guardian. ^ a b c Aitken, Stuart (10 May 2011). "Charanjit Singh on how he invented acid house ... by mistake". The Guardian. ^ William Rauscher (12 May 2010). "Charanjit Singh – Synthesizing: Ten Ragas to a Disco Beat". Resident Advisor. Retrieved 2011-06-03.